it was absolutely inevitable. 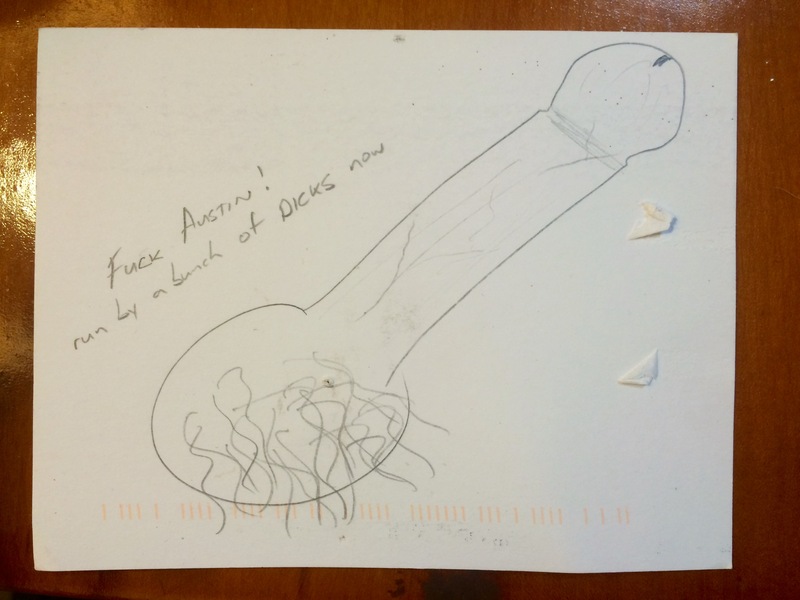 the day i opened the wwla post office box to pull out a phallus drawing was something i knew was coming, and so, enter the debate on whether or not to post it. i am a firm believer of freedom in one’s artist expression; something made even firmer between a conversation between my husband and i this morning. he was telling me one of his nephews was asking his uncle’s take on a conversation between he and his peers… saying his peers said “i don’t like to be offended.” i would like to know how that works. how do you live your life? how do you challenge yourself? how do you even know what you believe without testing yourself, your limits or what you believe to be true? how can you even trust anyone, let alone yourself? it’s with this hotheaded outburst, i decide to share with you something i personally find hilarious and honest. click here if you’d like to see. if you don’t care to see it, then so be it. i hope y’all have a lovely weekend.